Wrist Watch for Ladies in Golden and Silver Color. This range is also used to build brand image of a company by Printing their logo. 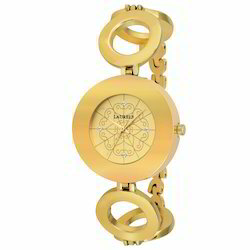 This Golden Dial Wrist Watch is designed using premium quality raw material. The offered wrist watch is made available in various designs to suit demands of customers. We have in store for our customers a quality range of Golden Wrist Watches for promotional activities. These are available in various designs and shapes as per customer's requirements, and watches can be easily adjusted accordance to wearer’s wrist. Shivani A2Z Solutions Pvt. Ltd. The traditional look and feel of Golden Hand Watch provides it with an unparallel elegance. It is in accordance with the latest styles. They promote the good will of your brand. The quality of the product ensures that they last long. They come with perfect finish and colours that last long even after years of constant usage. We are engaged in offering an impregnable range of Men's Golden Chain Square Dial Watch Item Code: PIONEER20601. These Men's Golden Chain Square Dial Watches are specially designed keeping in mind their delicate nature and functions. We take into account the diverse needs of our clients and offer suitable range of Men's Golden Chain Square Dial Watches.